Following in the footsteps of Star Wars, Indiana Jones, and Harry Potter, Disney's Pirates of the Caribbean is the next film franchise to get the LEGO treatment from TT Games. The Captain Jack Sparrow image you see here is not an official model from the upcoming game, but this custom creation from Devon Syvertsen shows that there's already an audience hungry for a video game crossover between the amusement park ride-inspired film quadrilogy and everyone's favorite toy building bricks. LEGO Pirates of the Caribbean: The Video Game will cover all four films in the Pirates series: The Curse of the Black Pearl, Dead Man's Chest, At World's End, and the upcoming fourth film, On Stranger Tides. Players can expect to play with more than 70 different characters as they adventure through more than 20 levels alone or with a friend. The game is coming to the Xbox 360, PlayStation 3, PC, Wii, DS, and PSP, with a release date that coincides with the fourth film's May 2011 premier. "Pirates of the Caribbean is a globally successful franchise based in action, adventure and humor perfectly suited for a LEGO Pirates of the Caribbean: The Video Game adaptation," said Graham Hopper, executive vice president and general manager, Disney Interactive Studios. "Combining the excitement of playing as Jack Sparrow and other recognizable characters from the franchise will make the game fun for players of all ages throughout the world." Toy fans should celebrate as well; Disney Consumer Products and the LEGO group also revealed Pirates of the Caribbean construction sets, due out this spring. 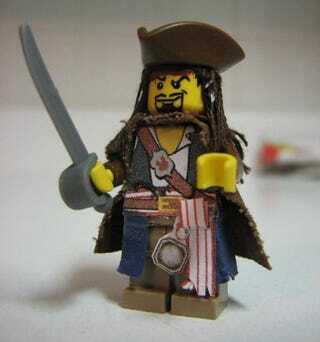 I just hope this doesn't alienate LEGO's more traditional pirate line. They've been making booty calls since 1989, way before Captain Jack came and stole the spotlight. What do you guys think? Does this make up for the canning of Armada of the Damned?